A common question many green industry businesses are faced with is if they should take on holiday lighting in their off season. Once the colder weather comes in (and if you don’t push snow), your business and it’s revenue comes to a halt. This happens to most seasonal businesses. They would hit the winter months and revenue stopped completely. Any business or person could use the extra cash, but some businesses aren’t equipped or able to push snow so you end up stuck. Unless you are in the snow plowing business, most green industry businesses struggle to find any revenue in their offseason. Holiday lighting allows your business to make extra revenue during those months where job requests are low or non-existent. 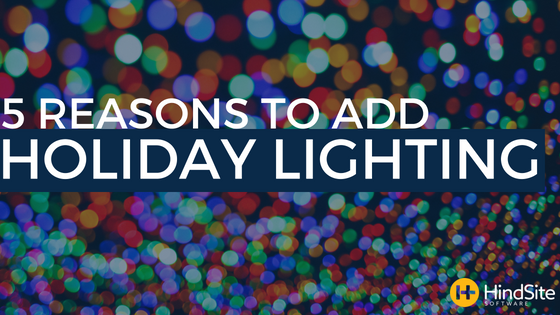 Holiday lighting does not require a lot of extra skill or equipment. The basics are ladders, installation equipment, and the lights themselves. Most of your guys will know how to put up lights just from personal experience, so training costs will be low if any. The added revenue for your business means you can keep your crew on year round. They will appreciate having a job even in the slow months, and you won’t have to hire a brand new crew with different skill sets. One of the best parts about doing holiday lighting is that you already have a customer base that you can ask to try your new service. This makes for easy business and very low marketing costs. Your customers already know the great work you do for them during your busy season, so you have an in with them that way. They may even have friends or family that would be interested and could refer to you. The least you can do is ask because the worst they can say is no. Holiday lighting can even provide your business with revenue year round. Not only will you make revenue for putting up and taking down the lights, you can also charge a small monthly fee to store their lights and decorations throughout the year. Customers will love not having to pack everything away in boxes under their stairs each year, and your business will love the extra bit of cash flow that comes in from it. I strongly suggest you consider taking on holiday lighting if you don’t have work to do during your off season. It is a great extra source of revenue, keeps your employees employed, and can help you keep in touch with your customers year round.